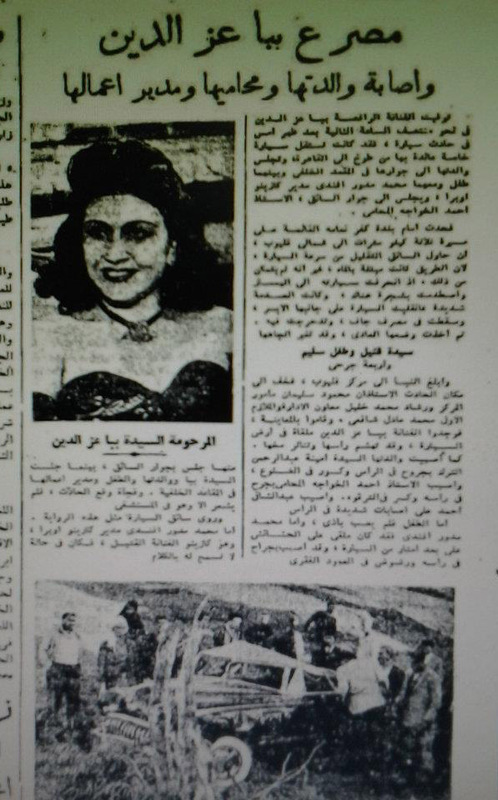 This article appeared in Al Ahram newspaper on February 6th, 1951, page 7. The translation below was done by Priscilla Adum. The first photo below shows the top of the article. The second photo shows the entire full-length article from top to bottom. Click on either photo to see a larger, more detailed version of it. The dancer and artist Beba Ezz el-Din died yesterday at about 2:00 p.m. in a car accident. She was riding in a private car in which she was returning from Toukh to Cairo. Her mother was sitting beside her in the back seat, and between them sat a child. Accompanying them was Mohamed Medwar, the manager of the Casino Opera, and sitting next to the driver in the passenger seat was el Oustaz Ahmed El Khawaga the lawyer. In front of the village of Kafr Na3ama, which lies 3 kilometers north of Kalyoub, the driver of the car attempted to slow down because the road was wet, but he was not able to. The car skidded to the left and hit a tree. The crash was so violent that the car flipped over onto its left side and fell into an empty drainage ditch, continuing to flip over until it stood right side up once more, but facing the opposite direction. The news was reported to the Kalyoub authorities. El Oustazien Mohamed Soleiman the chief of police, Rashad Mohamed Khalil the assistant, and the officer Mohamed Adel El Shaf3e went to the site of the accident to investigate. They found the artist Beba Ezz El Din on the floor of the car with severe injuries to her head. Her mother, El Sayeda Amina Abd El Rahman El Terk had head wounds and fractured ribs. The lawyer El Oustaz Ahmed El Khawaga had a head injury and a fractured clavicle, and Abd El Shaafi Ahmed had severe head injuries. As for the child, he was not injured at all. Mohamed Medwar was lying on the grass several meters away from the car with injuries to the head and trauma to his spinal column. Inside of Madame Beba's purse were 285 pounds and 580 malemes, a ring adorned with 28 diamonds, a gold wristwatch, a gold Quran charm, and a notebook indicating that she'd made purchases worth about 1,000 pounds, as well as private papers and cosmetics. Also, on her ring finger was an expensive diamond. The registration of the car was also determined. It belonged to a lawyer and member of Parliament who had loaned it to her. After the Public Prosecutor investigated the accident site and listened to the testimonies of eye witnesses, he went to the hospital. He took statements from those whose conditions permitted them to speak; i.e., the mother of the deceased Beba and El Oustaz El Khawaga the lawyer, as well as the driver of the car. In the evening, the body of the late artist was allowed to be moved from the hospital. It must be noted that the deceased Beba bought the Casino Badia over a year ago. She managed it on her own, as she was not married, nor did she have any children. She lived with her mother and her sisters who are also artists. News of the terrible accident quickly spread to Cairo, particularly among artists. Many of them hurried to Kalyoub Hospital filled with grief, weeping over their deceased colleague. 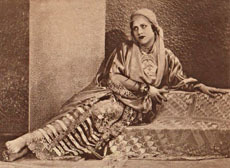 ABOUT THE PHOTO: Beba Ezz el-Din reclines on an assuit shawl. 1937. 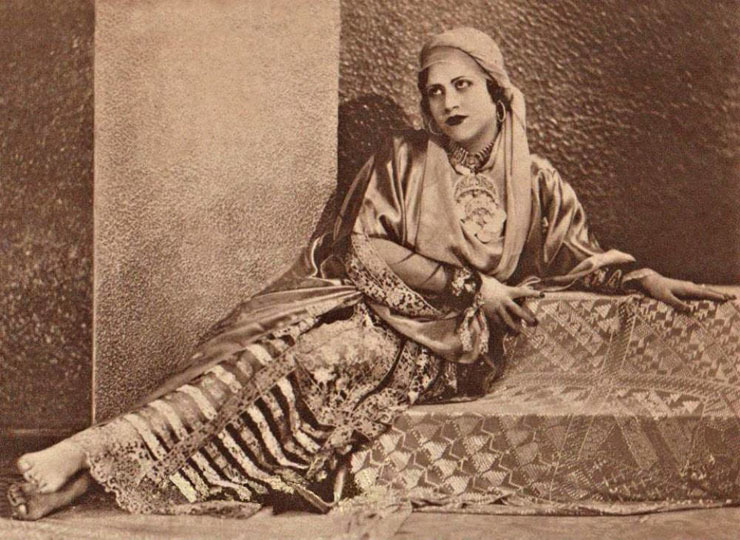 Beba Ezz el-Din was the dancer who purchased two of Badia Masabni's nightclubs. She purchased Casino Badia on Emad el-Din street in 1936 through devious means. Years later, in 1950, she purchased the Casino Opera when Badia sold it to retire to Lebanon. A VIEW OF THE CAR AFTER THE ACCIDENT. IT'S LOCATED DOWN IN THE DRAINAGE DITCH, SURROUNDED BY SEVERAL EYEWITNESSES. They learned the identity of the artist and of the persons who were with her, and they sent word to the municipality. El Oustaz Farhi Soleiman Bek, the mayor of El Kalyoubia and the main chief of police as well as El Oustaz Mustafa Nour the public prosecutor went to the site of the accident, searched the area and opened an investigation. The injured people were transferred to the Kalyoub Hospital where Dr. Mohamed Helmi, the head doctor, treated them. Also, the body of the deceased artist was transferred into a room near the room of the injured people. The editor of El Ahram visited the injured people and questioned El Oustaz Ahmed El Khawaga the lawyer about the accident, who told him that he had travelled with Beba to Toukh to take care of some judicial matters. After they had finished he sat down in the passenger seat beside the driver while Madame Beba, her mother, the child and her club manager sat in the back. The driver of the car related a similar story, but Mohamed Medwar the manager of the Casino Opera was not in condition to talk. Some of the investigators search through the money and jewelry that was found in Madame Beba Ezz El Din's purse. On the left side of the picture is Oustaz El Khawas, the editor of El Ahram. Badia Masabni: The Lady and Her Clubs. By Priscilla Adum. Beba Ezz el-Din Wins Beauty Contest. August 16, 1933. Translated by Priscilla Adum. Beba Ezz el-Din Investigated for Theft. July 15, 1935. Translated by Priscilla Adum. Among Dancers of Cairo and Alexandria, How Did Some Of Our Dancers Learn The Art Of Dance? Badia Masabni and Beba Ezz el-Din Tell. Translated by Priscilla Adum. New and Second-Hand Costumes: Our Elegant and Not-So-Elegant Dancers. Translated by Priscilla Adum. Death of Beba Ezz el-Din and Injuries to Her Mother, Her Lawyer, and Her Business Manager. Translated by Priscilla Adum. 1930 Ad for Grand Opening of Badia Masabni's New Club in Giza City. Translated by Priscilla Adum. 1933 Ad for the Show at Casino Badia That Included the Beautiful Eyes Contest That Beba Won. This ad also identifies Beba as one of the cast members in the show. The advertisement appeared July 27, 1933, and the beauty contest was August 2. 1937 Opening of Sala Badia Under Beba Ezz el-Din. March 10, 1937. Translated by Priscilla Adum. 1939 Rival Ads for Badia Masabni's & Beba Ezz El Din's Clubs. October 31, 1939. Translated by Priscilla Adum. 1930's Beba Ezz el-Din's Casino in Alexandria. Translated by Priscilla Adum. 1940's Badia Masabni's & Beba Ezz El-Din's New Dance Troupe. Translated by Priscilla Adum. 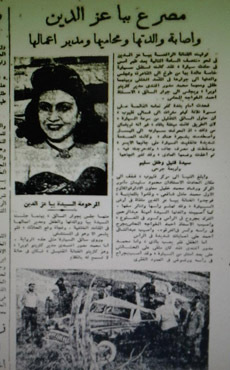 1950 Ad Promoting Casino Opera Show Under Beba Ezz El-Din's Ownership. Translated by Priscilla Adum.